Alash are featuredas guest artists on a CD which has just won a Grammy Award for Best Pop Instrumental Album. The album, Jingle All the Way, presents familiar American holiday music in innovative and imaginative arrangements by the celebrated American band Béla Fleck & the Flecktones. Grammy Awards are given by the National Academy of Recording Arts and Sciences of the United States for outstanding achievements in the music industry. The announcement was made at the 51st Grammy Awards ceremonies in Los Angeles on February 7, 2009. 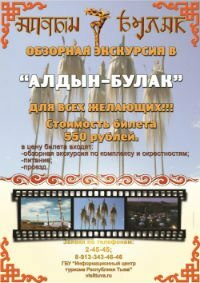 The premiere of the full-length, artistic film “Secret of Genghis Khan” (By the Will of Genghis Khan), produced in Yakutia, will take place in Ulan-Bator on February 19. In Russia, the showing will be on March 12, 2009. In the capital of Buryatia, according to the numbers of tickets sold in each movie theatre where the premiere will be held, it should be a true Yakut diamond. A Discussion of the reporter from Tuvinskaya Pravda with the poet and dramaturgist, member of the Writers’ Union and Union of Theatre Workers of Russia, Merited Artist of Republic Tuva, Eduard Mizhit. -Eduard Bairovich, tell us, please, briefly, about the history of making the play. -Many years ago, during a discussion with the outstanding director, now a Merited Artist of Russian Federation, national artist Alexei Oorzhak, it became clear that our interests and ideas concerning history of Tuva and its present are very similar. 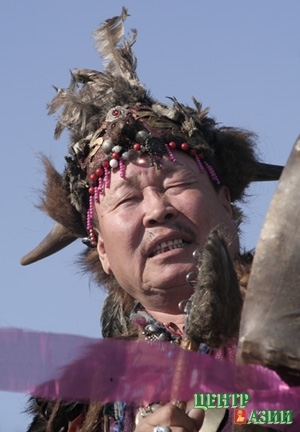 At that time the idea of producing a trilogy about the ancient history of Tuva was born. The historical drama-essay, which later also became a spectacle, “Who are you, Subedei?” became its first part. The historical drama “Kultegin” is the second part of the planned trilogy. The drama was written in 1996, and in 1997, there were some additions and corrections. 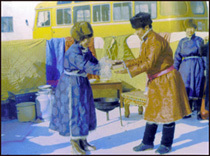 Kara-ool Dopchun-ool shamanizing. The one who speaks with the spirits believes that the main problem of humanity is lack of spirituality. Photo by Yevgeniy Antufyev. The shamanic organization “Adyg Eeren” (Bear Spirit) participates in the internacional project “Drum of the World”, founded in 2006 in Norway by Birger Mikkelson. The author of the project set up an ideal goal – healing of the Earth. He believes that there is just one hope for humanity: to return to life in harmony with nature. And to make that happen, everybody has to change inwardly, instead trying to change others. “ All lives are interconnected one with another by indelible ties”, is one of the main themes of the project. “Adyg Eeren”, based in Kyzyl, submitted an application to participate in this project and was accepted. The Drum of the World will come to republic Tuva in May 2009 and will stay until July. Center of Asia, by Nadezhda Antufyeva. Following the direction of the Kamby-Lama of the Republic, Tuvan Government officially determined the date of the Buddhist New Year – Shagaa. The date falls on a different day every year, and has to be calculated by the astrologists of the Buddhist Traditional Sangha of Russia. This year it falls on February 25. The regulation which designates February 25 as a free day was accepted by the Parliament of the Republic on January 29, in accordance with the law “Government holidays in Republic Tuva”. The law-givers also stretched out the preceding work week, transferring the free day of Sarturday, Feb.21 to Tuesday, Feb.24 – “ for the reason of rational use of free and non-working days.”. That way, Shagaa, together with the “red” Monday, a Russian holiday dedicated to the Patriot Defenders of the country, will constitute a 4-day pre-new-year vacation.